According to a dynamic summary report on the home page of the IUCN/SSC Polar Bear Specialist Group website called State of the Polar Bear, there are now 22,600-32,000 polar bears worldwide, when tallied by nation. The “Nations” page of the Polar Bear Specialist Group’s “State of the Polar Bear,” a dynamic summary that can be launched from the home page of the IUCN PBSG website, http://pbsg.npolar.no/en/ [published Oct. 15, 2012] Click to enlarge. This is a big change from the 20,000-25,000 that has been touted as the global polar bear population since 2005 (see Aars et al. 2006; Obbard et al. 2010) and my post on polar bear population estimates. UPDATE Jan. 7. 2014 – The PBSG has announced that a new population assessment is due later this month, see this January 1 post. The graphic described in this post has moved to the page called “Population information” and the official estimate of 20,000-25,000 is no longer present. There was no press release associated with this announcement. 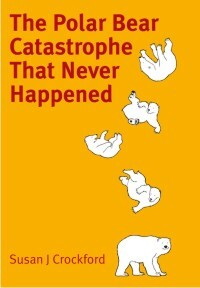 I have never seen an estimate of 22,600-32,000 for polar bears given before – where did these numbers come from? One explanation is that despite the PBSG insisting that it has no valid population estimates for Russia, Greenland and Norway, it must have. If it didn’t, why produce a map listing polar bear populations by nation in the first place? 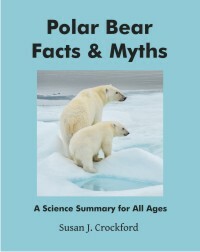 Suggesting that Russia, Greenland and Norway have no polar bears (i.e. zero) would be patently untrue. 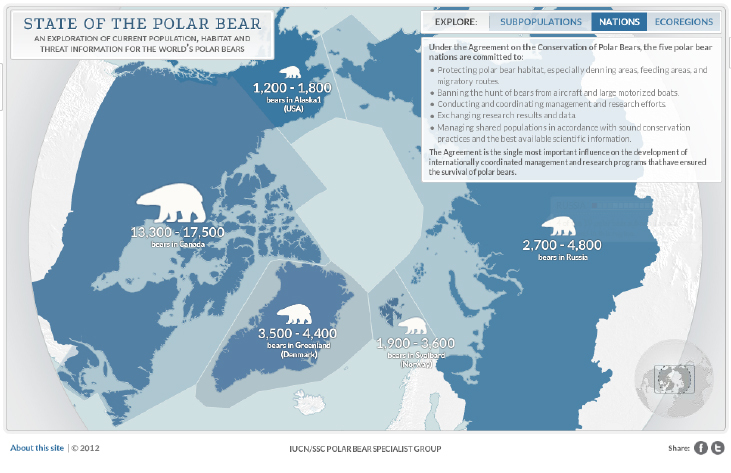 So the PBSG had to provide polar bear population estimates for these three nations. Apparently, the PBSG were confident enough of their population estimates for Russia, Greenland and Norway to commit these numbers to their “State of the Polar Bear” summary that’s featured on the front page of their website. If there could be as many as 32,000 polar bears worldwide, why have we not heard of this before? Is this another example of data being kept secret? [see previous discussion here and here]. Or is something else going on? Apparently, there was a special meeting of the PBSG held last October (2012), see below, and I wonder if it had anything to do with this? I’ve copied the text of the press release from the website below, as well as the preliminary agenda [emphasis below is mine]. The IUCN/SSC Polar Bear Specialist Group will convene in Oslo for an extraordinary and exclusive members-only meeting October 24-27. There is a need for the group to evaluate internal procedures and a variety of additional internal matters in order to be able to respond to future challenges and expectations. An imperiled focal species, political sensitivities and an increasing media focus have made the group’s work much more labour intensive during the last decade. Due to these pressures, members will meet to discuss how the group will cope with the new landscape. This is an extraordinary members-only meeting, NOT the group’s ordinary 16th meeting, which will be planned for next year. The upcoming meeting in Oslo will NOT discuss the status of subpopulations, but will mainly be concerned with internal matters. Read the preliminary agenda here [copied below as a jpeg file]. Many interesting topics on this agenda, including item #10. 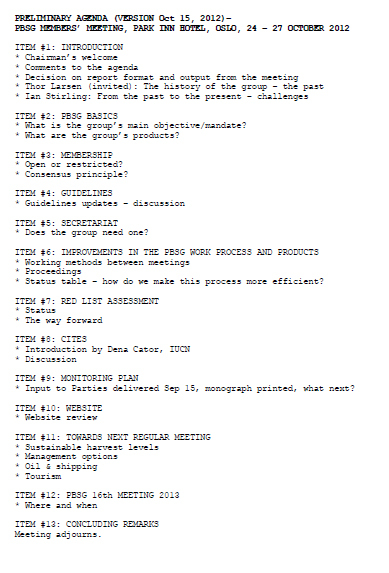 Copy of the preliminary agenda given for the three-day meeting of the Polar Bear Specialist Group (held 24-27 Oct. 2012), as provided on their website. 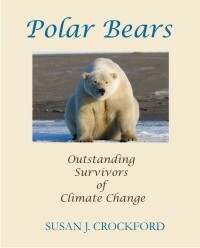 This entry was posted in Advocacy, Conservation Status, Population and tagged advocacy, IUCN, Polar Bear Specialist Group, population size, unpublished data. Bookmark the permalink.